Dedicated to Jasper Johns, who created a series of paintings of large overlapping numbers, this piece has 60 signs plus one extra ‘ubiquitous’ sign , consisting of musical symbols and numbers in unusual conjunctions, to be interpreted freely ‘not necessarily for piano’. The numbers are 1 to 8 hence ‘Octet’. 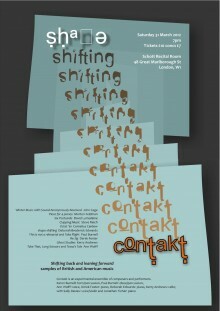 Some of Cardew’s performance directions and notes will be spoken during the performance. This piece was written in 2011 and is for any two players (the same person). Attempting to take flight from the great hunter Orion. Steve Reich’s ‘Clapping Music’ is written for two performers and is performed entirely by clapping. The initial unison rhythm is maintained throughout the piece by one player, whilst the other player gradually shifts the same rhythm until both players are in unison again at the end. 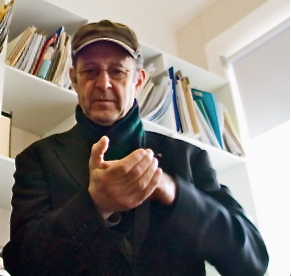 Steve Reich (born 1936) is an influential American composer who together with Philip Glass and Terry Riley is a pioneering composer of ‘minimal music’. His early works such as “It’s Gonna Rain” and “Four Organs” used tape loops and simple audible processes, and later works, such as “Different Trains”, took on historical themes, particularly those from his Jewish heritage. For me, there are few more extraordinary pieces of music than Beethoven’s last set of Bagatelles: resonance, wit, compassion, and an extraordinary sense of irony – and imagery that goes straight to the point. It has been a lifelong ambition of this composer to create resonance, rather than more crotchets, and these postcard pieces are essays on the way to that goal. Born in Sydney in 1931, David Lumsdaine was educated at Sydney University and Conservatorium. In 1953 he came to England, establishing his reputation with such works as Kelly Ground, Flights, Mandalas 1 and 2. During the sixties he was immersed in British contemporary musical life, and was increasingly sought after as a composition teacher. This led to university appointments, first at Durham (where he founded and directed the Electronic Music Studio) and subsequently at King’s College, London where he shared a post with his wife, the composer Nicola LeFanu. He retired from academic life in 1993, and now lives in York, while still spending a large part of his time in Australia. The three songs chosen for the concert tonight represent different moods. The first one, Take That, is a call to the barricades. The next two are based on actual events. Long Scissors is taken from a Case Study, and Tessa’s behaviour was witnessed by the composer in her garden. Composed in 1957 using chance operations and observations of the imperfections in the writing paper, Winter Music consists of 20 pages of music that can be played in whole or part by between 1 and 20 pianists. The music consists of isolated chords, notated conventionally but sometimes with ambiguity of clefs. Some large chords must have notes prepared soundlessly in advance, as each chord should be played as a single attack. The piece appeared in Britain in 1960 in a magazine, New Departures, who organised concerts that involved Cardew, and there was much cross-fertilisation of ideas between Cardew and the Americans at this time. First performed by John Cage and David Tudor, a four-piano version was given a few months later and a 13-piano performance (including Luciano Berio) in California in 1962. 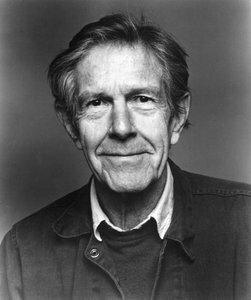 John Cage (1912-1992) was an American composer, a pioneer of aleotoric and electronic music. He was one of the leading figures of the post-war avant-garde. Critics have lauded him as one of the most influential American composers of the 20th century. Ghost Studies is based on three ideas reflected in other works – Song to the Siren by Tim Buckley, a few lines from Campo Santo by W G Sebald, and four lines from Burnt Norton by T S Eliot. They are about ‘ghosts’ of desires, of the past and of the multitude of possibilities. I wanted to make a sound piece comprised of three separate and aurally unrelated sections that articulated ideas about ‘ghosts’ – other people’s and our own. Similar to other recent pieces I have written for Contakt concerts at Schott’s, the recital room space/place as an instrument is important to this work. There seems to have been a tradition of multi-piano works in New York in the 1950s. Stefan Wolpe (Feldman’s teacher) wrote Enactments for 3 pianos in 1950-3. John Cage’s Music for Piano 4-84 (1953-6) can be performed by ‘any number of pianists’ and his Winter Music (1957) is for ‘1-20 pianists’. Feldman himself wrote 5 Pianos in 1972. In Piece for 4 Pianos all the instruments start together and have the same material, but the beats are not coordinated, and they may drift apart (or back together again). Morton Feldman (1926-1987) was born in New York. A major figure in 20th century music Feldman was a pioneer of indeterminate music, a development associated with the experimental New York School of composers also including John Cage, Christian Wolff, and Earle Brown. Feldman’s works are characterized by notational innovations which he developed to create his characteristic sound: rhythms which seem to be free and floating; pitch shadings which seem softly unfocused; a generally quiet and slowly evolving music; recurring asymmetric patterns. His later works, after 1977, also begin to explore extremes of duration. had in mind updating the 19th century title Albumleaves to refer to tracks on a record album; the pieces had elements of jazz, pop and folk style. In Re-Jig, rhythmic disruption and harmonic expansion re-jig the folk style into a more complex idiom.